i. Recent positive developments suggest that Iraq has made important progress towards political and economic stabilization, although the situation remains fragile and reversible. Recent months have seen a sharp decline in incidents of violence, especially in the Baghdad area, and a corresponding decrease in the rate of internal displacement of the population. This reflects improved security as well as successful initial steps towards political reconciliation. Macroeconomic performance has also improved although growth has been volatile. the recent declining trend in oil prices. iii. However, results from past and ongoing reform efforts remain far from meeting the needs and expectations of the Iraqi people. Unemployment remains extremely high and access to basic services severely limited. Electricity supply is unreliable and is far exceeded by demand; access to clean water and sanitation is the lowest in the Region. Recent improvements in access to education and health services have not yet translated into significant welfare gains on the part of the people of Iraq. vast resources to improve the welfare of the Iraqi people and rebuild its infrastructure. The main role for the international community, including the World Bank Group, is therefore to help Iraq use its own resources more effectively. v. Working in Iraq has been very challenging for the Bank Group and other donors. While some notable successes have been achieved, the effectiveness of assistance has been hampered by issues related to both the country’s operating environment and the approach followed by the donors. 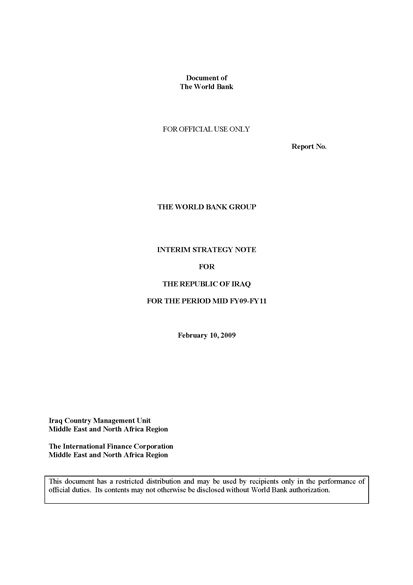 Operating environment issues – which also affect the Government’s ability to execute its own investment budget – include: the fragile political and security situation; the unstable policy and institutional environment; the Government’s weakened institutional capacity, and weaknesses in Iraq’s banking system. Issues related to the approach of the Bank to Iraq include the selectivity of assistance as well as business processes and fiduciary arrangements which have been unfamiliar to Iraqi counterparts and are challenging for Ministries with limited capacity. vi. The design of this third Interim Strategy Note benefited from a stocktaking of the Bank Group’s engagement with Iraq to date. The goal of the stocktaking exercise was to identify the key bottlenecks for the implementation of the previous ISNs and extract lessons for this ISN. This exercise informed the design of this ISN: (i) the continuing centrality of institution building; (ii) the critical importance of interest and engagement on the part of ministries and implementing agencies; (iii) the need for increased selectivity in terms of the ability to identify and seize opportunities as they arise to achieve concrete results; (iv) the need to focus on reform efforts that do not overtax Iraq’s existing capacity and that more clearly reflect the country’s current political and security situation; and (v) the need for increased flexibility in the design and programming of Bank assistance and for experimentation with alternative implementation arrangements for the Bank’s assistance program for Iraq. (i) public financial management; (ii) banking sector reform; (iii) support to planning processes and strategy design (not only at the central level, but also at the sectoral and provincial levels); (iv) private sector development; and (v) energy and services. viii. 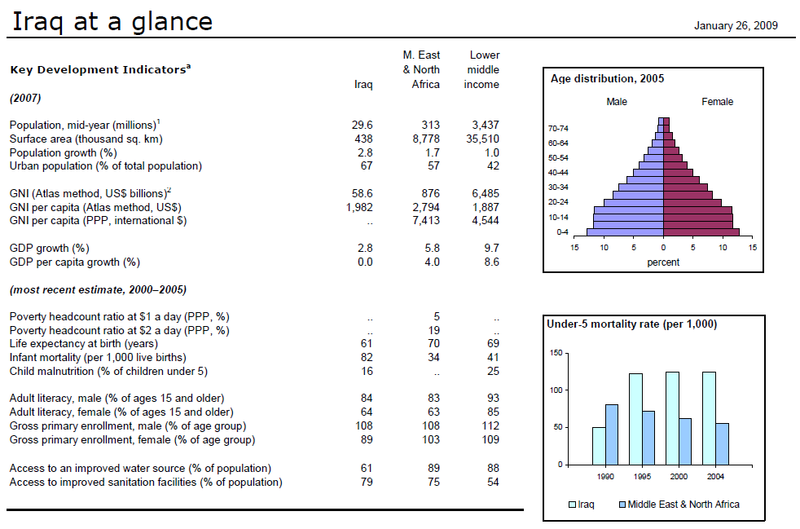 Given Iraq’s unique characteristic of a well resource endowed Middle Income Country (MIC) with a fragile environment, this ISN is proposed for a longer time horizon than the typical ISN. The time horizon for this ISN is proposed to be from mid-FY09 through FY11, to be updated to a full Country Assistance Strategy if and when circumstances allow. This interim strategy contains lessons and principles of engagement. The work program beyond FY09 would be kept up to date through Annual Business Planning, jointly with the Iraqi Government to ensure it meets the evolving needs of the Government as well as evolving opportunities for engagement. ix. The central guiding principle of this ISN is that Iraq is well-endowed with natural and financial resources, and that the main role for the World Bank in this context is to help Iraq use its resources more effectively and transparently. This principle impacts both the form and the content of the proposed work program for the next two years. However, it needs to be tempered by recent developments in the global economy and their impact on Iraq’s projected oil revenues for the next few years and its increasing need for external financing in the short-to-medium term. Hence, this ISN anticipates IBRD financial support as requested by the Iraqi authorities. enterprise reform (2004). The Government has also expressed interest in borrowing from IBRD as the need arises, increasing IFC support, and getting MIGA guarantees that could leverage private financing. Other instruments include the State and Peace Building Fund, and possibly, Treasury services. management of public resources, including human, natural and financial; and (iii) supporting policies and institutions that promote broad-based, private-sector-led growth, with the goal of revitalizing the private sector and facilitating job creation. IFC and MIGA will play a key role particularly (but not exclusively) with respect to the third thematic area. New activities under the ISN will be chosen on the basis of criteria for selectivity reflecting opportunities to achieve concrete results on the ground. xii. The three thematic areas are closely linked with the key goals of the International Compact with Iraq. The first ISN theme responds to the goals of the International Compact with Iraq (ICI) which are related to Iraq’s reconstruction and recovery efforts, including strengthening the energy sector and developing a stable, competitive and sustainable agriculture. The second ISN theme responds to the ICI goals of improving public financial management as well as strengthening institutions and improving governance. The third ISN theme responds to the ICI goals of implementing economic reform to create an enabling environment for private investments as a driver for broad-based growth. consultations held, this ISN will aim to: (a) enhance the effectiveness of instittion building and analytical and advisory activities; (b) strengthen the implementation of the current portfolio; (c) introduce more flexibility in the Bank Group’s programming and ability to experiment with alternative implementation arrangements; and (d) foster donor coordination. For planning purposes, this ISN is based on the assumption that progress in the security situation over the next two to three years would continue to be slow and incremental, with a risk of reversal. xiv. Risks. There are high risks to the World Bank Group’s program in Iraq. The most important risk pertains to the political and security situation, which remains fragile, as does the country’s operating environment. To mitigate this risk, the strategy emphasizes flexibility, and the Bank will adjust its activities as appropriate. Given the current limitations on mobility within the country, maintaining a vibrant dialogue with counterparts on issues of policy reform as well as implementation, and ensuring adherence to core fiduciary and safeguard requirements will remain challenging. These risks are substantial despite the Bank’s mitigating measures, which include capacity building, local oversight capacity, and prudent financial management procedures.